Three Came Home is a 1950 American post-war film directed by Jean Negulesco, based on the memoirs of the same name by writer Agnes Newton Keith. It depicts Keith's life in North Borneo in the period immediately before the Japanese invasion in 1942, and her subsequent internment and suffering, separated from her husband Harry, and with a young son to care for. Keith was initially interned at Berhala Island near Sandakan, North Borneo (today's Sabah) but spent most of her captivity at Batu Lintang camp at Kuching, Sarawak. The camp was liberated in September 1945. Adapted and produced by Nunnally Johnson, the film starred Claudette Colbert in the lead role. It is now in the public domain and so is available to watch in its entirety online at no charge. Upon the film's February 1950 release, Bosley Crowther said the film "bids fair to stand as one of the strongest of the year". 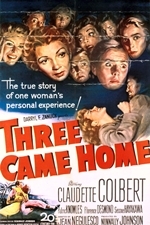 At the 1950 Vichy Film Festival, the film won the Best Film Award and Colbert won the Best Actor Trophy. At the 1951 Freedoms Foundation Film Awards ceremony it was at the 4th place for "Outstanding achievement in bringing about a better understanding of the American way of life".